ST. GEORGE – Four parcels of land in Washington County are under consideration by the Bureau of Land Management for oil and gas leases. Location of parcels under consideration for oil and gas lease sale in May 2017. 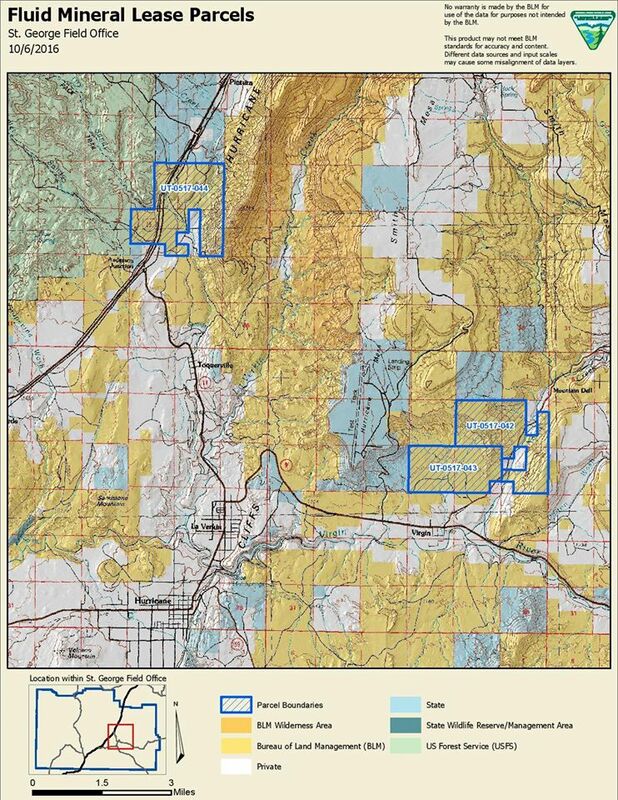 Two parcels north of Leeds are not shown on map | Image courtesy of Bureau of Land Management via Southern Utah Issues. Four parcels of public land in the county have been nominated for oil and gas extraction, Bureau of Land Management St. George Field Office Director Brian Tritle told the Washington County Commission Tuesday. The parcels are located in central Washington County, northwest of Leeds, near Anderson Junction and on Smith Mesa north of Virgin. Private parties can nominate BLM land to be considered for oil and gas leases; the nomination starts a long process of consideration by land managers. “Parcel nomination is not a guarantee that the desired parcel will be made available for leasing and potential subsequent development,” Tritle said. The final decisions are based on land use plans that consider potential impacts gas and oil development could have. It is likely that some Washington County parcels will be included in an oil and gas lease sale set for May 2017. An environmental assessment is being prepared by the St. George Field Office in coordination with the Utah BLM Office, Tritle said, to assess whether it is appropriate to include the four parcels in the lease sale. The environmental assessment is expected to be available for public review and comment in January 2017. The initial environmental assessment will include at least a 30-day public comment period and will result in a decision about whether to lease the parcels. The BLM is required to identify lands that are suitable for gas and oil production in land use plans, Tritle said. “There are areas where we won’t allow it, there are areas where we will allow it with certain restrictions – or really a variety of restrictions – and then there are areas that are less restrictive and more open,” Tritle said. The nominated parcels are all in areas that would require restrictions because habitat, cultural or other resources are present. If a parcel made it through the initial environmental assessment and a lease was purchased, that would trigger a more in-depth National Environmental Policy Act, or NEPA, analysis. The NEPA process would consider specific factors such as surface disturbance, drill site location, the timing of operations, the location of roads and more, and would offer more opportunities for public comment. Commissioner Zachary Renstrom expressed concern about Washington County Water Conservancy District plans to build a dam in the Ash Creek area in the Anderson Junction area. Those concerns will be addressed by the BLM’s approval process, Tritle said. Tritle said his office is contacting and coordinating with a number of entities about the project, including the Utah Division of Wildlife Resources, Zion National Park, Utah Division of Wildlife, State Institutional Trust Lands Administration in addition to Hopi and Paiute officials. Potential issues that have already been raised about the parcels include the proximity to residential areas, the loss of crucial winter habitat for mule deer, air quality, noise pollution and light pollution. “So are we the next Uintah Basin?” Washington County Commissioner Victor Iverson asked Tritle. Tritle told the commission there has been drilling north of Virgin in the past and there are some capped wells in the area. However, oil production was not found to be economically feasible. “But there was oil there,” he said. Commissioner Alan Gardner said there were oil fields above Virgin in the 1950s and early 1960s. “I don’t know how deep they were, but it was not very good oil. It was pretty sulphury from what I understand,” Gardner said. According to information from the Washington County Historical Society, a number of exploratory wells were drilled near Virgin in 1907. Most failed, but a handful eventually produced small amounts of oil. Oil was also discovered in Bloomington, however, in 1935 the Escalante oil well located 5 miles south of St. George exploded, killing 10 people and seriously injuring two others. This is absolutely fantastic news and I’m sure this will result in a positive reaction from the community and this will be a great opportunity for the county and the residents of it. and I would like to thank all those involved in making this possible. I hope you are being sarcastic. Just want I want to look at (and smell) when I’m out hiking and enjoying our beautiful surroundings. I’m sure a lot of others feel the same way. Do you have to set your alarm to wake up at four in the morning and post your daily pill induced blabbering? A lot of the hiking and biking trails actually start or end on old drilling roads. The area they have marked already has some capped wells. Maybe the old Virgin oil refinery could live again. This area use to have a lot of history before people started moving here and sweeping it all away. I say drill away reopen the area over by Gooseberry too.